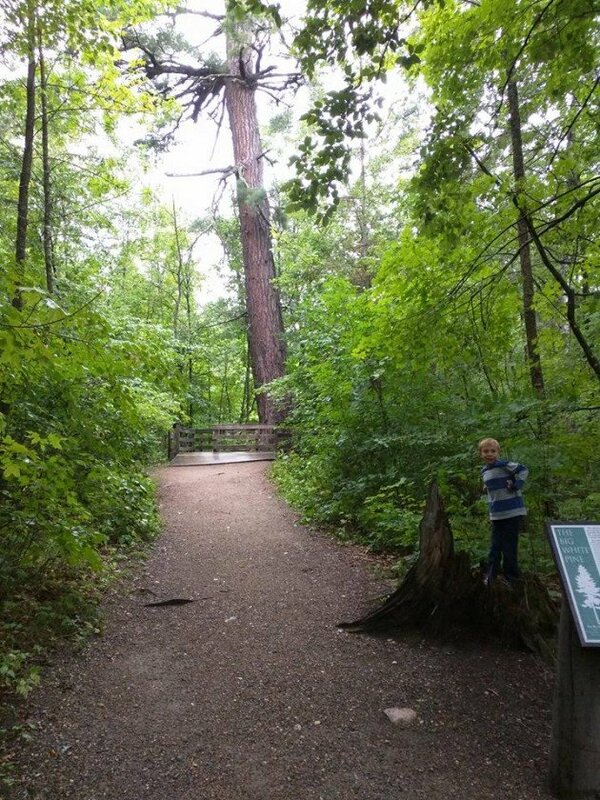 I’m writing this post a day late (sorry) from Itasca State Park, Minnesota. Over the last few days we’ve traveled from the Twin Cities north to lake country, back to the Twin Cities, and back up north, but to a different region. Which reminds me of something funny about Minnesota. When I studied the Efe Pygmies of the Congo, I discovered (and yes, it was me who discovered this amazing fact everyone now knows) that the Efe organize their space in elongated linear trails. They knew all about everything along those specific trails, and their knowledge of other trails was often very limited. If an Efe person spent time living with a group associated with a trail, he* would learn about that trail as well. Most interesting is that one’s knowledge of important things like where to find food (or danger) was based on experience not on general principles. So an Efe off his trail, or another trail he knew about, was not much better than, say, me (after a couple of years gaining my own experience) at having a clue. Also interesting is that there is a relatively formal connection between historic families (you can think of these as “clans”) and regular use of specific trails or sets of trails. So an older male member of Clan X will tend to know all the trails anyone in Clan X knows. Turns out this is true of Minnesotans as well. Many families or individuals live in the Twin Cities and have a cabin up north. If you look at extended families, perhaps several different nuclear groups will be associated each with a different cabin. For instance, my wife’s immediate family has two cabins on one lake. Grandpa and grandma originally had a different cabin on that lake, and cousins have yet another cabin next to that original cabin. Meanwhile other cousins have a cabin at a lake we (more or less) pass on the way north to the aforementioned cabins. A couple of different work-related friends of both my mother in law and father in law have cabins up north, and most of them are in the same general vicinity. But more interesting and more striking to me, and not generally known by the Minnesotans themselves, is that these Cities-Cabin associations are organized along specific trails, and individuals know the details of things like where to find food (or danger) along those trails very well, and know little or nothing of the other trials. The different trails could be described by the different major roads one uses. For example, I-35 is linked to the Superior region and cabins in the Arrowhead, and also to this major and amazing bird refuge. To the west, there is 169 that run up through Grand Rapids (not the one in Michigan) and cabins up there. I used to know someone with a cabin in those parts a short walk from the Lost Forty. Don’t know what the Lost Forty is? One of the most interesting locals in Minnesota, but if your cabin is up a different route you would not know about it! Then there are the cabins farther west along the 10/379 route. There we have a sad story. That route formerly ran through Brainard, then up towards Park River and Walker. The part of the road that went through Brainard was replaced, not long ago, with a road that ran through an undeveloped town called Baxter. Now, Baxter is heavily developed, with big box stores and all, and Brainard is a welfare town. I don’t want to make any accusations or anything, but that smells like base corruption to me. I wonder if it involved elected officials at the county or state level or both? That is the route that goes to all of our family cabins, up near or on the Cross Lake and Woman Lake chains. We drive through the Gull Lake chain to get up there, and if you go a bit father, you’re at Leech. So remember. Gull-Cross-Woman/Pine River-Walker/Leech. Any one or combination of those words will tell you if a person knows that route, and if they do, you can then make common reference to specific Dairy Queens, specific coffee shops, specific marinas, specific hardware stores, and specific groceries. To the west of this is the 10/71 route, where I am now. This is the route that ultimately leads up to Itasca, and actually, one of the better routes to Canada if you want to go to Lake of the Woods. Farther West the routes go mainly to the west and stop turning up north, because if you go up North there you just run into Fargo and who would really want to do that. But there is the Alexandria-Detroit Lakes axis, I suppose. Anyway, yes, the birds here are all wet because it has been raining, often heavily, for two days. And this is unusual. It is said that this is a winter pattern, large low dipping “down” from Canada in a deep trough, like happens in the winter with clippers, but getting kind of stuck here. It will be followed by windy weather tomorrow and things including the birds will dry off. Our most notable sighting is probably many dozen Wild Turkeys in various flocks. Otherwise everybody is hunkered down. We did not see a murmuration of starlings forming the face of Vladimir Putin. We also did not see a drone get knocked out of the sky by an eagle. The picture at the top of the post is the tallest white pine in Minnesota. And Huxley. The tallest red pine was nearby, but it is now known as the “Formerly tallest red pine in Minnesota.” Things happen. *I speak here only of Efe men. It is a culture, like most, with a great deal of differentiation between men and women and I mainly worked to understand what was going on with the men. I do not assume this applies to the women. The native American route that involves pine river is well known, at least for the Ojibwe era. You go up from Andover and follow the Rum River and then start skipping across lakes and marshes to the gull lake area, on up through Hole in the Day, Twin Lakes, etc. and probably on the pine river for a while and eventually the woman lake chain, then boy river, to Leech. Then, maybe over to Sandy Lake or wherever. Coming back, going south, you get on the express … the Mississippi … If you had gone straight north or northwest, you take the Crow River to the Mississippi (and you are probably a Lakoda-Dakota group Native American) or if you go northeast you are probably Leech Lake or some other group of Ojibwe, and you come right down the Mississippi. So by and large this is the 10-379 route.